This was a birthday present cake for my mother in laws 80th birthday party. The cake feeds 125 people. I made a butter cake and used a coffee "simple syrup". I tried to make it look like stacked presents. Decorated it with buttercream, fondant and ribbons. Michael this is a gorgeous birthday present cake. Your mother in law is lucky to have such a talented son in law. Wow! Thank you for entering the cake decorating contest. Please ask your family, friends and supporters to come and take a look and to vote, rate and comment on your entry. 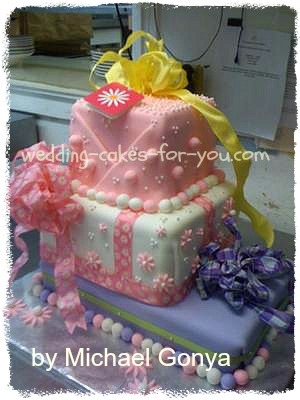 If you have not already done so find wedding cakes For You on Facebook and LIKE the page, subscribe to the RSS feed here at this site to be updated when I add new pages and or you Follow me on Twitter. cake for a 92 year veteran, Roger did not even wanted to cut it. But guess what? he still eating it and saying he never never had a cake like this one in his whole life. He was very happily enjoying his Birthday cake at 92. He loves Mike so much for taking the time to think of him on his Birthday. WOW How Talented what a great job. How gifted u must be to do this. My wish is to have a cake like this someday on my Birthday. Keep up the wonderful work u do . I Love the colors you chose for this cake. It is just sweet and happy looking (I'm sure you had her in mind when you chose them). Looks awesome! Love this cake, it's so cute!